Vacuum Breaker Medium Voltage Transfer Switches are rated for applications up to 15kV. They utilize various manufactures Vacuum Circuit Breakers, 100% Rated Copper Bus, Dead Fronts and are Electrically Interlocked; Mechanical Interlocking available upon request. 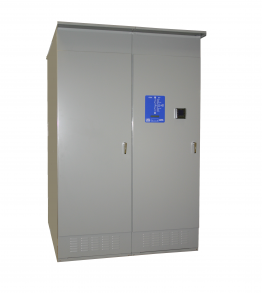 The Standard VB Automatic Transfer Switch (ATS) utilizes separate, internal spring charging motors, open coils and close coils, to operate both the normal and emergency insulated case units. Normally, the transfer switch operates on the preferred power source with the Normal insulated case unit in the closed position and the Emergency insulated case unit in the open position. The Standard VB ATS provides dependable, positive, programmed delay transfer to an emergency power source in the event of normal power source failure. All ATS are protected by a type of interlocking to prevent accidental paralleling of the sources. They are a Dead Front design with rear access for operator safety. Both Draw Out and Fixed Circuit Breaker designs are available. They are equipped with a manual charging handle, manual mechanical close/open pushbuttons and open/closed mechanical position indicators to safely operate the transfer switch manually. This information is not yet available on-line.